The Routes des Cretes is along the Mediterranean in Les Calanques, Cap Canaille in the Bouches du Rhone area in Provence, France. For any history lovers this trail is a must-see because it has a strong connection to World War I. The Route des Cretes along the Mediterranean Coast in Les Calanques, Cap Canaille, in the Bouches du Rhone region of the Provence, France, has a unique tie-in with World War I history and many people who are interested in this time period go to these cliffs to see this trail and walk it themselves. 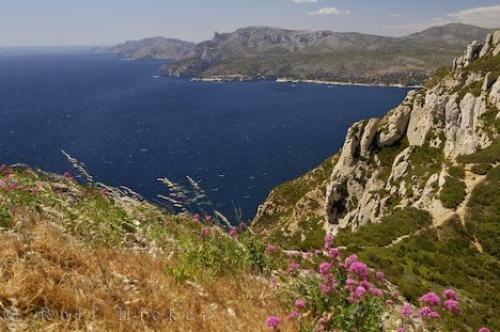 Photo of the Route des Cretes and Mediterranean Sea, Les Calanques, Cap Canaille, Bouches du Rhone, Provence, France. It begins at Col du Bonhomme in the mountains and from there you can travel to Grand-Ballon if you wish, which has some spectacular views of the Alps. You will travel through the region, Münster, if you wish to go that far, and this is where the savory cheese that is so famous to the region, and you can sample it if you wish. Despite what many will call its bloody past, this region is very beautiful and very special to history and is well worth the time to drive the Crest Road. Route des Cretes, Mediterranean, Les Calanques, Cap Canaille, Bouches du Rhone, Provence, France, Europe. I photographed this photo with the digital SLR camera model Canon EOS-1Ds Mark II, aperture of f/7.1, exposure time of 1/160 sec. on ISO 100, as always I used a original Canon Lens, the focus lenght for this picture was 38mm.